An advanced compact with impressive video that's ideal for travellers. The Sony Cyber-shot DSC RX100 IV sees Sony once again deliver a top class pocket camera, capable of producing outstanding images in low light, and with a big hitting video recorder and stunningly quick CMOS sensor. Sony Cyber-shot DSC RX100 IV is the fourth edition of the highly-regarded RX100 series (first launched in 2012). Unlike many rivals in the pocket camera market, the Cyber-shot DSC RX100 IV may be reduced in size but there certainly isn’t any reduction in image quality - it even outperforms some significantly higher-priced DSLR cameras. This “point and shoot” camera may not give you the total control and professional quality of a high-end SLR, but it’s not far off and is a great alternative for those who’ve discovered photography through their mobile phones and want to take it to the next level. The RX100 IV shoots significantly better pictures and video than you’ll ever get with a mobile phone but has the same level of portability (it’s small enough to fit comfortably in a trouser pocket) - making it an awesome travel companion. Compared to its predecessor the RX100 IV has really ramped up the speed and image quality, while retaining the familiar Cyber-shot design. The RX100 series is known for cornering the high-quality pocket-size camera market and this model continues the trend - the build certainly has a high-end feel, made of a magnesium coating that exudes durability. Although great for beginners, the Cyber-shot DSC RX100 IV does provide some “meat” for those camera enthusiasts who want more than just “auto mode” while on the family holiday. This means that Sony provide some good logically-placed buttons and a control wheel providing full manual operation of the camera for those that like to be in control. The viewing screen can be rotated so your photos can be taken from any angle and the camera is equipped with a standard 24-70 mm built-in lens - perfect for landscapes and portraits, but it won’t give you the zoom of a “paparazzi” lens. However, a major plus point is its extreme speed; with a "burst mode" of a massive 16 frames per second this is a brilliant camera for live action shots. And if you were worried that such a diminutive camera might struggle to produce great quality images you can rest assured, the Cyber-shot DSC RX100 IV takes photos of vivid clarity and with stunning colour reproduction, and especially impresses in poor light environments. Finally, the icing on the cake here is the video functionality of the RX100 IV. It’s mightily impressive and the “king” of super slow mo with its ability to shoot 1000 frames per second in 4k quality (if your memory card is large enough). 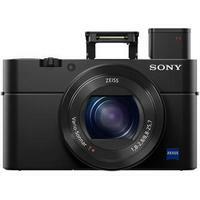 Why you should buy it: Sony’s latest Cyber-shot is light years ahead of previous versions and much of the competition. It’s quite simply one of the very best pocket sized cameras available in the UK.